Pyongyang redirects here. The world is a better place now that I went back in time to convince Julius and Ethel Rosenberg to instead run nuclear power plants. In a more favorable alternate universe, Julius & Ethel Rosenberg decides to run nuclear power plants instead of sell nuclear secrets to the USSR. Therefore, nuclear weapons stay a national secret for several decades! Because of this, the Korean War starts as usual, but when MacArthur (or MechaArthur) makes the Inchon Landings and kick the Commies out of the Korean Peninsula, China is just beginning to send troops across the Yalu River when MacArthur says, "Get the (pl)uck off the Korean Peninsula or else you'll have a LOT of your own little Hiroshimas in your cities!" 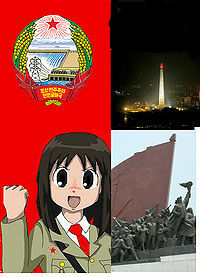 With China realizing that they could feel the intense pain that Japan felt 5 years previous, they say, "Fine! Fine! Korea is yours! Let's end the war already, shall we?" Thus, the Armistice was signed on a diplomatic yacht on the Yalu River between Dandong and Sinuiju, instead of a rickety hut in Panmunjom. As Pyongyang was ironically the center of Christian activity before the end of World War II, but all churches were demolished during the communist regime's brief stay there, Rhee decided to replant all churches with a vengeance, by also adding "satellite churches" EVERYWHERE in town. He stipulated that any building with the maximum optimal occupancy of 25 or more shall have a satellite church functioning somewhere in the building in some form. Whether residential, commercial, or for industrial purposes, these buildings would have a church. So there could even be a chapel for morning prayers before even starting work. At first, building owners were slow to comply, but Syngman decided that the capitalist regime of his should also rebuild its economy as fast as possible, so he incentivized the city to build satellite churches in each building in order to get a 50% tax subsidy. Not only that, but anyone who lived in a building with an embedded satellite church would get to pay HALF of their normal rent! After introducing those incentives, compliance became swift! The boost from the economy came from the 50% share of each of the churches' tithes, that go to the government. Years pass, all the while, Syngman's successors decide to give incentives to procreate, believing that more people will equal more workers, in turn more taxpayers, which begets more revenue for the government. By the 1990s, Korea's population exceeds 100 million, with Roh Moo-hyun City at 22.2 million people. Roh Moo-hyun City becomes the largest in Korea, due to the INTENSE concentration of religious universities & seminaries in the metropolitan area. The fact that there are no summary executions, no gulags, no famines, but an OVER-abundant supply of food in this timeline helped burst the population even faster. Also, Syngman's successors decided that not enough people are Christian, so the government handed out $100 incentives for EACH person one successfully converts to Christianity. However, if High School and College students successfully converted someone to a Christian, they would each receive a $1,000 scholarship, but only to the colleges here. This has also caused Roh Moo-hyun City to densify so large! Now at 91.7% Christian, Roh Moo-hyun City has been dubbed the "Jerusalem of the East" and has been designated a UNESCO World Heritage Site due to its holy significance. Because several major religious organizations are headquartered here due to the special economic relaxations that this city and the whole of Korea provides to them, this has also caused Pilgrimages of millions of Christians worldwide every year, akin to the Islamic Hajj in Mecca. This page was last edited on 31 May 2012, at 03:05.